Dustin Poirier pulled out of the co-main bout with Nate Diaz due to an undisclosed injury. Luke Rockhold vs. Chris Weidman II is the new co-main event of UFC 230. Even the main event has since been changed around and caused a stir in the media. A would be challenger robbed of a chance to compete for the Flyweight belt. The women’s 125-pound division has only begun to grow. The first women’s flyweight fight took place between Joanne Calderwood and Valerie Letourneau in 2016 in a non-title bout. Nicco Montaño became the women’s flyweight champ at the TUF 26 finale on December 1st, 2017. Valentina Shevchenko defeated newcomer Priscila Cachoeira with a submission in the second round. Shevchenko earned her title fight, outstriking her opponent 230-3. The Flyweight bout had been scheduled for September 8, 2018. Before the fight, Montaño had to be transported to a hospital due to the effects of weight cutting and vacated the title soon after. Shevchenko would fight Joanna Jedrzejczyk for the vacant flyweight belt. But the bout was called off as UFC 230 needed a main event and Valentina Shevchenko stepped in to fill that space. Sijara Eubanks made it to the finals of TUF 26 to fight for the women’s Flyweight title set for December 1st,2017. She had to withdraw due to kidney failure. Nicco Montaño beat Roxanne Modafferi to become the first women’s Flyweight champion. Eubanks returned to face Lauren Murphy and won the fight by a unanimous decision on June 1st, 2018. Nicco Montaño vacated the women’s Flyweight Title on September 8th, 2018. On the 2nd of October Eubanks announced the title bout agreement had been signed for November 3rd, 2018. She would be facing Valentina Schevchenko for the 125-pound strap at UFC 230. The title fight seemed set unless an injury or weight cutting problem occurred. The only thing that stopped such a lackluster fight from occurring came in the form of Derrick Lewis. The fight became Alexander Volkov’s until Lewis uncorked a right-hand that knocked his man out with thirty seconds of the fight to go. Derrick Lewis put on a show in the cage and on the mic in his post-fight interview. He even has chemistry with Heavyweight champion Daniel Cormier to go off. The UFC brass decided to scrap the bout in favor of Daniel Cormier vs. Derrick Lewis for the Heavyweight title. Derrick has stated that his conditioning needs work before he fights with Cormier. It turns out that Valentina Schevchenko and Joanna Jedrzejczyk bout has been rescheduled for UFC 231, leaving Eubanks in the lurch and robbed of a title fight opportunity. Eubanks had not been told of her removal from the card and had instead found out about it on the Internet. 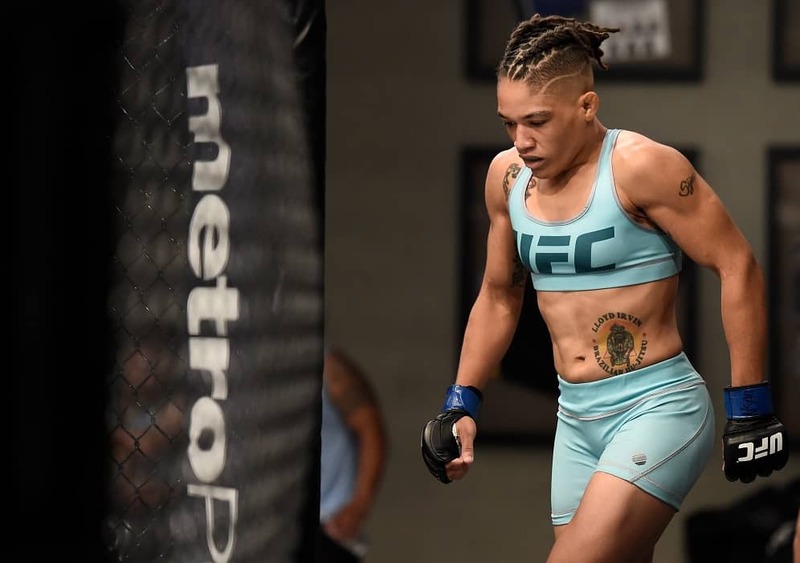 Eubanks has been rescheduled to face Roxanne Modafferi in the opening prelim bout of UFC 230 instead. The UFC has been accused of playing favorites in the past and put on fights that make no sense when it comes to rankings. Shevchenko stepped in to fill the space and when the UFC found a better deal they returned things to their original position. It’s great that the UFC has put together two strong bouts for the coming months but at the cost of breaking a bout agreement that both fighters signed really the way to go about things?